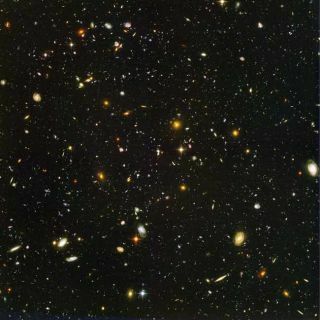 From its expansion and acceleration to dark matter and energy, the universe continues to amaze and perplex astronomers. Here are some of the most surprising and interesting things about the universe we live in. The universe began with the Big Bang, and is estimated to be approximately 13.7 billion years old (plus or minus 130 million years). In the 1920s, astronomer Edwin Hubble made the revolutionary discovery that the universe is not static, but rather is expanding. But, it was long thought that the gravity of matter in the universe would slow this expansion or even cause it to contract. While dark energy is thought to be the strange force that is pulling the cosmos apart at ever-increasing speeds, it remains one of the greatest mysteries in science because its detection remains elusive to scientists. Mysterious dark energy is not only thought to be driving the expansion of the universe, it appears to be pulling the cosmos apart at ever-increasing speeds. In 1998, two teams of astronomers announced that not only is the universe expanding, but it is accelerating as well. According to the researchers, the farther a galaxy is from Earth, the faster it is moving away. The shape of the universe is influenced by the struggle between the pull of gravity (based on the density of the matter in the universe) and the rate of expansion. If the density of the universe exceeds a certain critical value, then the universe is "closed," like the surface of a sphere. This implies that the universe is not infinite but has no end. In this case, the universe will eventually stop expanding and start collapsing in on itself, in an event known as the "Big Crunch." Yet, if the density of the universe is exactly equal to the critical density, then the geometry of the universe is "flat," like a sheet of paper. Here, the universe has no bounds and will expand forever, but the rate of expansion will gradually approach zero after an infinite amount of time. Recent measurements suggest that the universe is flat with roughly a 2 percent margin of error. The universe is overwhelmingly made up of things that cannot be seen. In fact, the stars, planets and galaxies that can be detected make up only 4 percent of the universe, according to astronomers. The other 96 percent is made up of substances that cannot be seen or easily comprehended. The cosmic microwave background is made up of light echoes left over from the Big Bang that created the universe 13.7 billion years ago. This relic of the Big Bang explosion hangs around the universe as a pocked veil of radiation. The idea that we live in a multiverse, in which our universe is one of many, comes from a theory called eternal inflation, which suggests that shortly after the Big Bang, space-time expanded at different rates in different places. According to the theory, this gave rise to bubble universes that could function with their own separate laws of physics. Researchers searched the best available observations of the cosmic microwave background for signs of bubble universe collisions, but didn't find anything conclusive. If two universes had collided, the researchers say, it would have left a circular pattern behind in the cosmic microwave background.